During these times of upheaval, the need to co-create change and move forward in alignment with others has never been greater. The leadership challenges of today are too complex for any one person to solve alone. In our rapidly changing, increasingly uncertain and globally networked world, leadership needs to be less about individual heroics and more about listening to – and mobilising – collective potential. There is an art – and science – to enabling dialogue where people find their authentic voice and access their untapped collective intelligence. Developing the skill set to lead, hold – and participate in – effective dialogue is critically important for leaders and their teams, whether they want to create a new vision, implement a new strategy or shift their performance. Our approach integrates a systemic lens and design thinking into conversational leadership and best practice in dialogue. This enables leaders and teams to hold powerful meeting spaces that lead to breakthrough conversations, and helps them navigate critical business challenges and find solutions that strengthen the system as a whole. Builds trust. Without this vital ingredient, teams don’t work, leaders lack traction and projects fail. The quickest way to build trust is through being willing to talk about what matters most – and encouraging others to do the same. Cultivates collaboration. Without good dialogue, problems remain unresolved and “silo working” sets in. Good communication is at the heart of productive teamwork, successful projects and effective leadership. People who talk together create together. 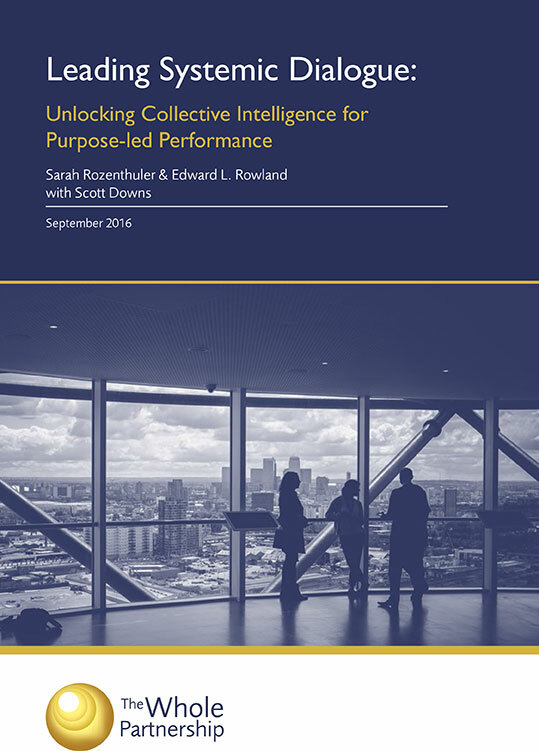 Unlocks collective intelligence and inspires new ideas. People share their best thinking, work hardest and come up with their freshest ideas when they are engaged. By listening to people, helping them listen to each other and paying careful attention to their interdependent relationships, we can access the wealth of untapped intelligence in a team or organization. Strengthen the whole system. By integrating a systemic approach, it is possible to find ways forward that strengthen the whole ecosystem of stakeholders. To read more about our systemic approach to dialogue, including a case story, read our free ebook here. “What should leaders like myself do in this “VUCA” world? No surveys and analysis of the market, nor a search through the web will provide you with the answers to this question. The answers must lie within yourself and within your own organisation. Sarah, Ed and their book will help guide you – using a systemic approach – as you quest for the solution”. A short video by Sarah explaining how this approach can unlock collective intelligence. If you would like to speak to us about Dialogue and unlocking collective intelligence in your organisation, please Contact Us. Or click here for Co-Creating Change though Dialogue, our 2-day open programme.